The dreamy nature of the twelfth house fits in well with the independent desires of Uranus. Uranus encourages you to think different, but you already have your head in the clouds. It is a match made in heaven, which can be a good thing or a bad thing. Uranus symbolizes innovation, creativity and rebellion, and wants you to go against the norm to be true to yourself. The 12th house has issues with this, for you like helping others to feel useful. This often means your happiness depends on other people. Because of your inability to rebel completely, you find other small ways to do this. Rather than directly helping someone, you set up a program that does it for you or you offer opportunities to those less fortunate. With Uranus in 12th house, you work behind the scenes to do things for others to avoid having to explain why you do them. Your lack of confidence keeps you from doing anything unconventional, and Uranus makes you feel guilty for not having the guts to just do what you want. But your caution is a good thing, because it keeps you grounded in reality. Uranus could take over your fantasy world and keep you lost in it forever. Know your Uranus sign right away! 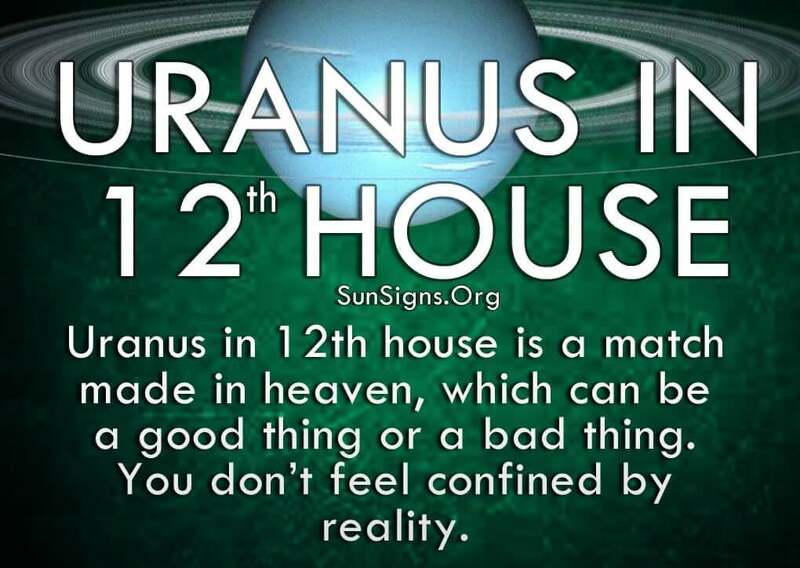 The best thing about Uranus in the twelfth house in astrology is that you don’t feel confined by reality. While some people are afraid to dream big, you look past the physical restrictions and try anything to make your wish come true. Because of this, you are unlimited to the kinds of jobs you can do. Anything where you are surrounded by creative types and forward-thinking individuals is a good place to start. And don’t be afraid to knock down any barriers that you come across, because that’s how innovations become reality. The one area you do need time to yourself is when you feel stressed and need to recharge your batteries. It’s better to have some alone time, for you can really focus on what’s bringing you down and figure out ways to get over the feeling. Pulling the strings behind the scenes can be tiring, especially if you don’t have anyone else you trust to help you. While you constantly strive to make the world a better place to live, not just for others but also for you, you place a lot of pressure on yourself to match your dreams exactly. But sometimes you dream too big and it’s not a realistic goal. That doesn’t mean you have to give up on it, you just have to think about it in a different way. This is where Uranus can help, because it offers a totally different path for you to explore and gives you the energy to explore it. This is where you can really shine and not feel guilty about it. Once you’re able to take your ideas further than they’ve ever been before, you will build the confidence and momentum you need to go even further. Nothing will be able to stand in your way, not even those old pangs of self-doubt. And if you have trouble at a particular point, stop and ask for help. Uranus in 12th house people have a huge social network who appreciate all that you do for them, and are more than willing to bring you the rest of the way.